For those who want to play but don't quite understand. So... Pokemon has been trying to get gamers up and around other gamers for like, forever. And I'll be damned if they didn't finally get it done. I've been on more walks these past few weeks then I have in a very long time. I get pretty bored on walks normally so playing the game is like a fun scavenger hunt that counts your steps and gives you rewards! - Some Pokemon can evolve into other pokemon using candy and stardust. - PokeStops are REAL WORLD locations (aka they are points of interest on google maps, usually churches, fountains, sculptures, etc) - spin the little icon to get rewards! - Pokemon Gyms are also REAL WORLD locations (just like a PokeStop) - but you battle your pokemon here! - There are 3 teams (Instinct, Mystic, and Valor) to join once you hit level 5 and are eligible to battle in a gym. 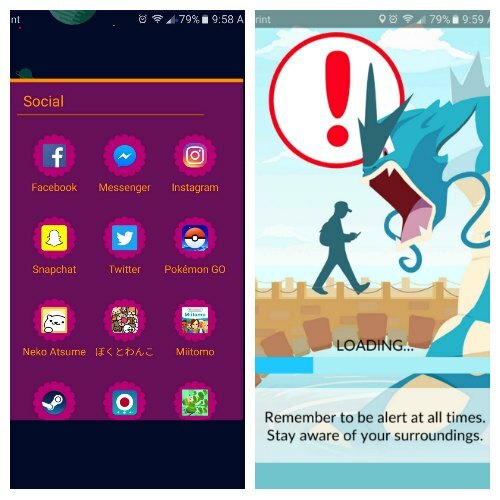 Lets boot up Pokemon Go and let it load - please make sure you listen to the Gyarados loading screen and PAY ATTENTION to your SURROUNDINGS. Too many stories of silly people who should know better getting hurt because they are too absorbed in their phone and can't be bothered to look around. Also, please dont pokemon go and drive - have a passenger play for you. Lets take a look at what I currently see on my screen. 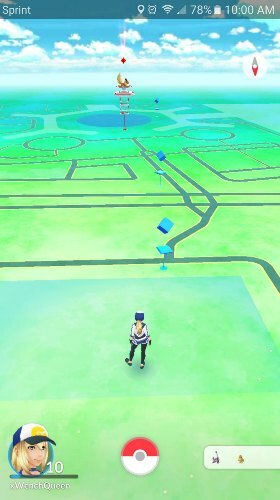 Those little blue cubes on my screen are PokeStops - if I were to travel (walk, run, drive) to those locations I could tap them and then spin the sign to get rewards! Rewards vary but they usually give potions, revives, pokeballs, berries, and eggs. Even further along you'll see that giant icon that's red - that's a Pokemon Gym. And it's red because it's currently owned by team Valor. Different gyms are different colors based on which team currently owns it. Red is Valor, Mystic is Blue, and Instinct is Yellow. I'll give a pretty basic rundown on gyms - if the gym is owned by your team then you battle the gym to build it up and make it stronger. If the gym is owned by another team then you battle the gym to bring its rank down and to hopefully defeat it, and then take it over. You can only do this after level 5 though, and depending on the gym there will be some serious competition and it will probably not be easy to do alone. You need to work AS A TEAM with some friends/fellow players to bring down strong gyms. You'll need some pretty high CP for some of these gyms, and practice makes perfect. You can also tap your trainer to see your trainer "profile". You can see which name you chose, what level you are, your current XP and progression through your level, your journal (which is a record of what pokemon you saw where and what you caught/when you caught it), your team, and your medals (kinda like trophies or achievements). So, if you click the pokeball icon on the bottom middle of your screen you'll get your main menu. 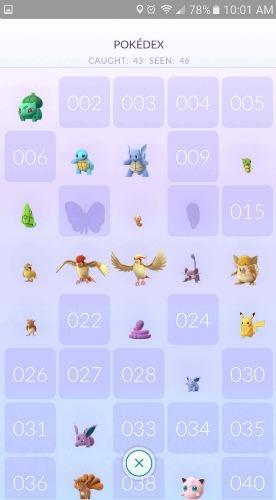 If you click the pokemon button on the left you'll see all of the pokemon you currently have. The top tab over is all of your eggs. 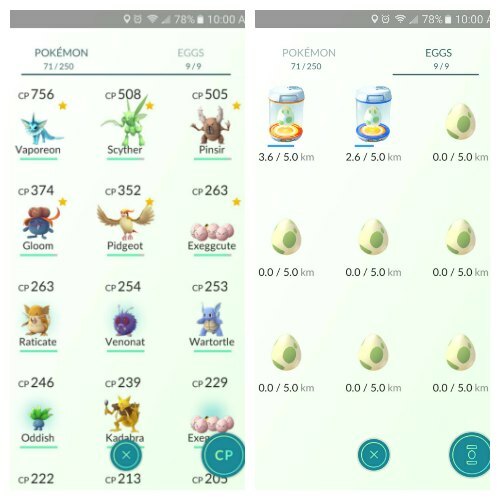 Pokemon hatch from eggs, and you'll need to travel the amount indicated on the egg in order to hatch it. There are 3 egg lengths 2km, 5km, and 10km. Different pokemon are associated with different distances, so it's time to get walkin'! Heading back to the main menu and if you click the Pokedex button it gives you a library of all the current pokemon available to capture/evolve in the game. The pokemon completely pictured are pokemon that you've caught/hatched. Shadows or outlines are pokemon that you've seen but you didn't get the opportunity or chance to catch them yet. The boxes with the numbers on it are just flat out pokemon that you haven't seen or evolved yet and therefore you don't even know what they are. (I mean for people who have played the game you could definitely tell what they are based on the number alone or the pokemon around it, but that's neither here nor there). There is soooo much more associated with this game that I couldn't possibly go into it all. Please, please, please be kind to each other. Pokemon may not be YOUR thing, but that doesn't mean that others won't thoroughly enjoy it. Gaming is just as much of an entertainment medium as professional sports - and no one enjoys being teased or bullied for their hobbies. 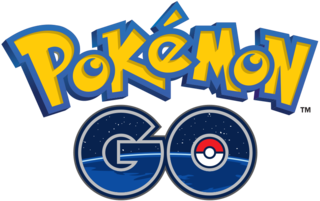 Pokemon is an ageless game that a lot of the older players remember growing up on, especially since this game is based on the original 151 pokemon that came out when many of us were in our early teens. Pokemon is bringing generations together under one platform and making us work together - isn't that enough? Haha thanks! I had no idea either so I figured I'd spread what knowledge I do have!